by Mark MacGillivray • The Medicaid single premium immediate annuity offers a great opportunity for brokers to target the aging population and offer an alternative to the high cost of long-term care insurance. by Daniel Hayes • Variable annuity products have gained momentum as an important part of an overall retirement planning strategy. 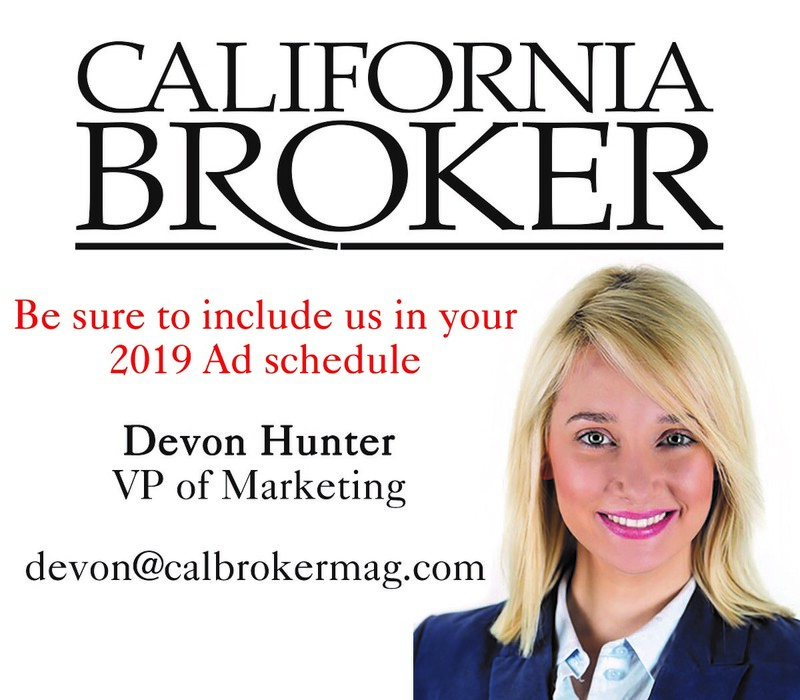 Each year California Broker surveys health maintenance organizations (HMOs) in the state with direct questions about their plans. We then present the answers to such questions here for you—the professional agent or broker. by Joseph Berardo, Jr. • With consistently rising fully insured premiums, small- to medium-size businesses are seeking alternative funding options. by Brian Hartstein • However, one that can still deliver tremendous value to specific business owner clients is the Section 79 Plan funded with permanent life insurance. by Dr. Ann D. Clark • Employers turn to latest trends in concierge benefits to improve employee retention amongst Millennial generation of 18 to 28-year olds. by Leila Morris • To get a broker’s take on vision benefits, we interviewed Patrick Tibbs with Everence Financial Services, who is winner of the Transitions Vision Benefits Broker of the Year Award. by Richard Hom • Making sure that the medical plan and the vision plan work together is crucial to a holistic healthcare model. by Kyal Moody • Health insurance brokers who are looking to expand their business portfolio need to look no further than their aging parent or the senior who lives next door. by Dennis Healy • Three out of four full-time employees experienced at least one legal life event in the past year. Legal plans help employees and keep benefits costs down. by Michael Klachefsky • Disability is about relying on brokers to find the right provider with programs that might solve workplace issues that have an impact on productivity, employee health and well-being, as well as a company’s profitability. by Larry Schneider • Searching for disability coverage in the wrong way may be costly and can lead to big mistakes. The following tips will help you avoid some of the landmines in your search. The market for Medicaid single premium immediate annuities (SPIAs) is unknown territory for many brokers. Changes to state laws as well as enforcement of the 2006 Deficit Reduction Act (DRA) have significantly reduced brokers’ ability to use Medicaid annuities. Many brokers have been led to believe that Medicaid planning was eliminated, altogether, because of the scarcity of this product, the sparse education that’s available, and changes to the law. Even before the law was passed, few insurance carriers offered SPIAs. The rules have changed. Changes at the state level have improved how states view the use of Medicaid SPIAs. This, in turn, has made it an acceptable product, from the carriers’ and agent’s points of view. There is no longer a sense that someone is taking advantage of taxpayer monies or someone who might be able to otherwise avoid Medicaid altogether. • The look-back on gifting, over time, has gone from two years to five years. • Balloon payments are not allowed. This is when a client takes only interest until many years later and then receives a large payment. • The use of a Medicaid SPIA for a single person has been shut down. • In all but 14 states, the state must be the primary beneficiary (the most significant change). With Medicaid being run primarily by each state, state governments have been able to plan appropriately for their use. The Medicaid SPIA gives brokers a great opportunity to target the aging population with an alternative to the high cost of long-term care insurance. A senior can pay for nursing home costs with private pay, long-term care insurance, or Medicaid. The first two options can be very costly and the senior may not qualify for long-term care insurance. With private pay or out-of-pocket, a person must use personal income or assets to pay for services and support for at-home or residential care. Income can come from a variety of sources, such as social security, pensions, stocks, bonds, and more. When these options are not enough to pay for care in full, people must take on any remaining cost themselves. Long-term care insurance provides the cost of long-term care beyond a predetermined period. Long-term care is not generally covered by health insurance, Medicare, or Medicaid. But not everyone is qualified for a policy. Policies are age-related and health-related. Since you need to be in reasonably good health to purchase a policy, you are not likely to qualify if you have any pre-existing health condition or you are a high health risk. Also, the younger the person is, the lower the premiums will be. If you wait to purchase long-term care insurance at a late stage in life, it may be too expensive and no longer be a viable option. A Medicaid SPIA may be the answer for clients who have health issues or don’t have enough money or assets to pay for care. But before you get too far into the sales recommendation, it is important to remember that most people don’t have a financial background. They may have a sense of the investment options that are out there, but may know very little about annuities, especially in relation to Medicaid. If you can gauge your client’s knowledge level, it might be useful to offer a brief investment 101 session. What is an annuity? What are the different types of annuities? What does it do for me? This sometimes-forgotten step can offer your client the reassurance that they are making the right decision and have partnered with a client-centric, knowledgeable broker. Additionally, it is in line with suitability requirements and contributes to your client’s understanding of the product and determination that your recommendation is suitable to the client’s exacting needs. Another useful tip is to use a scenario that paints a picture for your client. Using dollar amounts (like the example below) is likely to convince even the most hesitant of buyers. A husband and wife (both 87) have $300,000 in countable assets (home and auto are exempt). The husband has to go into a care facility. Both spouses are concerned about the cost and how it will affect the wife and her ability to live comfortably. Also assume that the private pay cost of the nursing home is $8,000 per month and that the husband has $3,000 of monthly income from social security and his pension. This leaves a $5,000 per-month difference. The broker could suggest that the couple purchase a $200,000 Medicaid SPIA in the wife’s name and then show what the potential payments would look like. Using the above dollar amount, the period-certain payout for 65 months (five years and five months) will be $3,067 per month in income. Note that Medicaid SPIAs must only use period-certain payouts, which are generally based on the healthy spouse’s life expectancy. This $3,067 will be paid to the wife and she will be able to keep and use that income. When the husband enters the care facility, his full $3,000 per month of income (Social Security and pension) will go to the facility and pay the difference up to the Medicaid pay amount. As a result, the couple’s total assets have been reduced from $300,000 to $100,000 (amounts received from a SPIA are viewed as income stream and not assets). The husband now qualifies for Medicaid assistance for the nursing home and the wife has $100,000 of countable assets. She gets to keep her income (Social Security and pension) plus a monthly income of $3,067 per month for 65 months. (Rules vary by state; always consult an elder planning attorney when speaking about Medicaid planning.) This example also helps simplify a normally complex process. It sheds light on the overall goal of Medicaid planning. Now, what if your client (let’s say the wife) asks what happens if her husband dies unexpectedly after 24 months into his care? Say the state of Washington is the primary beneficiary up to the amount the couple paid for the husband’s care and the Medicaid pay amount was $7,000 per month. The couple paid $3,000 per month out-of-pocket (instead of the $8,000 out-of-pocket for private pay). The difference between the Medicaid amount and his payment is $4,000. The cap on what the state can collect is now $96,000 (24 months x $4,000). The state collects nothing if the wife lives for the full 65 months. If she dies with six payments remaining, the state would collect those six payments totaling $18,240. The couple saves $120,000. Mark MacGillivray is regional sales director for the annuity business for Standard Insurance Company. He can be reached via email at mark.macgillivray@standard.com. Special thanks to Ted Markow of Markow Financial in Seattle, Wash. for his contribution to this article. The Standard is a leading provider of financial products and services, including group and individual disability insurance, group life and accidental death and dismemberment insurance, group dental and vision insurance, absence management services, retirement plans products and services, individual annuities and investment advice. For more information about The Standard, visit www.standard.com. In recent years, the financial services realm has witnessed an industry-wide movement toward increased guaranteed income options for retirement. The Dept. of Labor formally joined the conversation by soliciting a request for information on this issue. It’s an issue that could facilitate the use of guaranteed lifetime income options in the defined contribution space. Accordingly, there has been notable innovation. Companies have introduced a variety of investment and insurance products that provide lifetime income. Variable annuity products, in particular, have gained momentum as an important part of an overall retirement planning strategy. By definition, variable annuities provide a monthly payout to investors. It’s based on minimum guarantees combined with market performance of the underlying portfolio they select. These products offer multiple options for payout, including an income stream for life. They also provide a return of the investor’s original investment through withdrawals or a death benefit. Investors can specify payouts for a fixed period or for life. Combined with other investment products, having variable annuities can be an extremely effective way to protect against the risk of outliving retirement savings. Unquestionably, those who are retired or are close to retirement need to protect their assets. Memories of the financial crisis are all too fresh and volatility has become the new norm. We are reminded that diversification can fail during crises when markets decline together. Yet we must remember that there is value in helping investors stay invested and maximize their asset growth potential before and after retirement. The ultimate investor conundrum is balancing the need to protect assets in a down market while having the investment choices that allow them to remain in the market to capture upside potential. Fortunately, new products offer built-in risk managed asset allocation strategies for variable annuities. These funds employ continual risk management and dynamic hedging techniques designed to help manage volatility and protect capital during market downturns so that clients can remain invested in the market at all times to capture upside potential. While the strategies do not ensure a profit or guarantee protection against a loss, they aim to reduce a client’s exposure to extreme market swings in order to provide a more consistent pattern of returns. Unlike traditional asset allocation investment methods, the best of these strategies allow people to stay invested in the market and continually manage risk. The risk/return tradeoff is optimized based on the current market environment. Traditional approaches, which often shift equities into fixed income options during down or volatile markets, can miss the most significant recovery periods. In short, protected funds in variable annuities seek to reduce volatility, protect account values, and maximize income during retirement. As a result, investors can continue to invest in a risk-controlled manner throughout their working years and throughout retirement. These institutional volatility and risk management techniques have traditionally been available to sophisticated high-net-worth investors. The good news is that these methods are becoming more accessible to the average investor. In the past, average investors did not necessarily have options that allowed them to hedge their risk and exposures to some of the more diversifying asset classes. Now this move is indicative of a larger trend, with more institutional strategies being introduced to retail environments. With these strategies, insurers are easing the burden on advisors – -allowing them to expand their offerings and bring more sophisticated options to the average investor while providing professional oversight and helping protect their clients from tail risk. A word to the wise: education and transparency are critical due to the sophisticated nature of these strategies. These products emerged when capital markets were at their most despondent. However, when creating them, the smartest insurers considered the need for these products to respond not only to the market of the moment, but also into the decades beyond. Experts agree that there is a broader long-term appeal of these compelling investment options. Boomer retirees want to protect their retirement portfolios while the younger generations X and Y continue to demonstrate conservative views on risk and investment. In fact, a majority of Generation Y and nearly half of Generation X are self-described “conservative investors” while only 39% of Boomers consider themselves such. This sentiment is not surprising considering the financial events that have shaped their views on risk. As such, their appetite for products utilizing protected strategies will persist. Daniel Hayes is president of Lincoln Investment Advisors Corporation (LIAC), the registered Investment Advisor subsidiary of The Lincoln National Life Insurance Company responsible for the management and oversight of the investment options within Lincoln variable life and annuity products as well as Lincoln Retirement Plan Services small and large market retirement products. He is also the Advisor for the Lincoln Variable Insurance Product Trust and the Lincoln Advisors Trust. Hayes joined Lincoln in 2008, and has nearly 25 years experience in the financial services and life insurance industry. Welcome to the 16th annual agents’ guide to managed care. 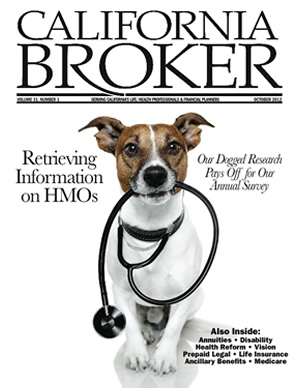 Each year California Broker surveys health maintenance organizations (HMOs) in the state with direct questions about their plans. We then present the answers to such questions here for you – the professional agent or broker. We hope that this valuable information will help you serve your savvy healthcare clients better. 1. Do you guarantee a time limit on getting referral/treatment routine, urgent, emergency? If not, how many days does it take? Aetna: Our internal policy is five days for routine, two days for urgent pre-certification, and no referral is required for urgent or emergency care. Anthem Blue Cross: Authorization by the PMG/IPA requires a decision in the following time frames: 72 hours for an urgent request; 14 calendar days for specialty referrals; and no prior authorization is required for emergency services. •Emergency care (acute, life-threatening): immediately. Cigna: While we don’t guarantee a time limit on getting appointments or referrals, we do have appointment accessibility standards and we monitor performance against these standards annually. Performance is monitored by analyzing several questions on the annual CAHPS (customer satisfaction) survey and reviewing customer concerns regarding appointment access. Health Net of CA: For urgent pre-service requests, a decision must be made in a timely fashion appropriate for the member’s condition, not to exceed 72 hours after receipt of the request. The practitioner needs to be notified within 24 hours of the decision, not to exceed 72 hours of receipt of the request (for approvals and denials). For non-urgent, elective or routine pre-service referrals, the decision is made within five days. The member is to be notified within 72 hours of the request (for approval decisions). For standing referrals, a decision must be made in a timely fashion appropriate for the member’s condition, not to exceed three business days from receipt of the request. Kaiser Permanente: While we can’t guarantee the wait times for all types of appointments, we do offer an array of options for determining the type of care that best suits a member’s needs and schedule appointments accordingly. Wait times for routine and urgent care usually depends on the member’s medical history and the urgency of their condition and they may be able to make urgent or routine same day appointments. PacifiCare: Optimally, the specialist referral process should take less than 30 days from referral to appointment. We monitor this standard annually using the Consumer Assessment of Health Plans Survey (CAHPS) member satisfaction survey. We adjust our goals by market depending upon past performance and national percentile benchmarks. Our standards are as follows: Routine Appointment <30 days, specialist appointment <30 calendar days, and urgent care <24 hours. We also have the Express Referrals program that streamlines the referral process. A primary care physician (PCP) in a participating Express Referrals provider group may refer a member to a specialist in one of many specialties in their group without prior authorization from the group’s utilization review committee. Members pay their normal office visit co-payment for a referral to a specialist. 2.Do you have any conditions/diagnoses/symptoms that are referred automatically? Anthem Blue Cross: The PCP, PMG/IPA determines automatic referrals for conditions, diagnoses, and symptoms. Members can self-refer to a contracted OB/GYN provider. Provider groups can participate in the Speedy Referral and Direct Access programs for referral of certain types of specialties for initial consultation and evaluation. There are also requirements for standing specialist referrals for chronic conditions and HIV/AIDS diagnoses. Blue Shield of California: No; however, Blue Shield requires that our contracted IPAs and medical groups employ a standard referral processing guideline of 24 hours from the time the necessary information is received. Our Access+ HMO plan has been designed to ensure members have a great deal of flexibility in accessing care inside the HMO network. Each Access+ HMO member chooses a primary care physician from an extensive network of general and family practitioners, internists, pediatricians, and OB/GYNs. We also ask our HMO physicians to refer members to specialists within their IPA or medical group; since we fully capitate all professional services, in-network referrals help control cost and utilization. Health Net of CA: Health Net delegates medical management activities to participating physician groups (PPGs). Each PPG has its pre-certification requirements and systems, which may include direct access to specialty care. For members who are not delegated to a PPG for management, such as Health Net’s Direct Network HMO membership or other fee-for-service membership, authorization for specialty consultations is not required. Members with a chronic condition or disease that requires continuing specialized medical care are eligible for a standing referral to a specialist. A standing referral allows extended access to a specialist for members who have life-threatening, degenerative or disabling conditions. Kaiser Permanente: Members identified who are with specific chronic or high-risk conditions, diagnoses, or symptoms are automatically referred for enrollment in whichever care management programs are appropriate. Participation in these programs is completely voluntary and if a member chooses not to participate, they may easily opt-out, though less than 1% chose to do so. Members also have direct access to all primary care services and can easily self-refer to specialty care in the Obstetrics/Gynecology, Optometry, Psychiatry, and Chemical Dependency/Addiction Medicine Departments. At some facilities, members may also self-refer for mammograms and Ophthalmology and Dermatology Department services. 3. Can a pregnant member go directly to a gynecologist without waiting for approval? Anthem Blue Cross: Yes, pregnant members can self-refer to an obstetrician/gynecologist in the PMG/IPA. Blue Shield of California: Yes, female members may self-refer to an OB/GYN in their personal physician’s Medical Group or IPA for an annual routine well-woman examination. Alternatively, if an IPA or medical group contracts with an OB/GYN as a network primary care physician, female members may select the OB/GYN as a primary care physician, as well. Health Net of CA: Yes. Kaiser Permanente: Yes, members have direct access to all primary care services and may self-refer for many types of specialty care including Obstetrics/Gynecology. 4. Do you have self-referral to a gynecologist for an annual well-woman exam? Blue Shield of California: Yes. Kaiser Permanente: Yes, to make access to Obstetrics/Gynecology services as convenient as possible, women can self-refer for Ob/Gyn appointments without the need for approval from their PCP. Routine Ob/Gyn care often includes basic health maintenance counseling and screening such as recommendations and reminders for immunizations, managing cholesterol, smoking cessation, and mammograms. 5. Can a member with severe back pain get an appointment with an orthopedist immediately? Aetna: The PCP determines this. Anthem Blue Cross: The PMG/IPA/PCP will evaluate the member’s conditions and symptoms and assess the need for a specialist visit following the group’s process for referrals as necessary. Blue Shield of California: Yes, Blue Shield developed Access+ Specialist for those times when HMO members want direct access to a specialist or physician other than their personal physician. For a slightly higher fixed co-payment, members can go directly to a specialist or primary care physician in the same medical group or IPA as their personal physician without a referral. To use the Access+ Specialist option, members simply call the physician they wish to see to schedule an appointment. Members can also choose to go through their personal physician to request a specialty referral and pay their usual office visit co-payment. Cigna: Yes, customers should consult their primary care physician who can contact an orthopedist or other specialist (neurosurgeon, neurologist) to arrange for an immediate appointment. At the direction of the physician, a customer can also be enrolled in Cigna’s chronic condition management program for lower back pain. A registered nurse helps coordinate timely care. Health Net of CA: Yes, as an emergency. Kaiser Permanente: We don’t require patients to see the PCP first to triage the patient, but because most back pain can be managed best by the PCP in the context of the person’s whole health. We care for people, not just problems. The PCP most of the time can diagnose and treat the causes of back pain, while ensuring the treatment does not impact a person’s other medical conditions. When pain does not follow the expected course, or is unusual in presentation, our orthopedists are available for immediate consultation. It’s coordinated, complete and convenient care. PacifiCare: Yes, with a PCP referral. 6. How long does it take to get an MRI or equivalent test when a lump is found in a member’s breast or uterus? Anthem Blue Cross: The PMG/IPA/PCP determines whether to make an urgent referral for diagnostic tests and whether an authorization is needed. When a member faces an imminent and serious threat to her health, this is an emergency situation in which according to the Prudent Lay Person Rule the member is instructed to seek care in an ER. For urgent non-emergent situations it is 72 hours. Blue Shield of California: Seven days or immediately in an emergency. Cigna: The customer’s physician determines the exact time frame. But, an appointment can be made immediately if medically necessary. Health Net of CA: Health Net delegates utilization management activities to medical groups. Therefore, if the member belongs to a delegated participating physician group (PPG), the PPG has its own pre-certification requirements, and an MRI may or may not require pre-certification. If the member does not belong to a delegated PPG and Health Net is responsible for conducting utilization management, MRIs require pre-certification. Health Net processes urgent pre-certification requests within 72 hours of receipt of all information. Requests for elective MRIs are processed within five business days. Kaiser Permanente: Except for very rare exceptions, the discovery of a lump in a woman’s breast would not prompt the use of magnetic resonance imaging (an MRI) as a diagnostic tool, but would immediately receive a mammogram to better understand the nature of the lump. Similarly, the discovery of an unusual uterine growth would be investigated with more direct methods. In clinical situations that do require other types of imaging – such as ultrasound – can be requested at the discretion of the doctor without the need for additional authorization. Breast MRI may be subject to additional clinical review to ensure that it is only being used in cases where the patient would benefit. Wait times for these tests vary depending on the availability of the testing facilities and the severity of the medical need. In some cases these tests are conducted by facilities contracted by Kaiser Permanente. 7. Can the member get a second opinion outside of the IPA or the medical group? Anthem Blue Cross: Yes, members have the right to a second opinion from a qualified healthcare professional in the Anthem network, as long as they have already received one from their PCP or a SCP in the group’s network. Blue Shield of California: Yes, all Access+ HMO members have the right to get a referral for a second opinion from their personal physician. A physician in the same medical group/IPA generally provides second opinions of care from a personal physician. Any specialist of the same or equivalent specialty in Blue Shield’s HMO network can provide second opinions of care from a specialist. All second opinion consultations outside of an assigned IPA/medical group require Blue Shield authorization. Health Net of CA: Yes, a member, his or her authorized representative or a provider may request a second opinion for medical, surgical or behavioral health conditions. If the member has an HMO or POS plan and requests a second opinion about care from a Primary Care Physician (PCP), the second opinion should be authorized by the delegated participating physician group (PPG) and provided by another qualified health care professional within the PPG. If the member requests a second opinion about care from a specialist, the member may request a second opinion from any provider of the same or equivalent specialty from within the PPG or IPA. Such specialist referrals within the PPG must be authorized by the PPG. However, if the request is for a specialist outside of the PPG, the referral must be authorized by Health Net. Kaiser Permanente: Yes, our doctors can refer members to non-plan providers for second opinions when medical expertise relevant to their condition is not available internally. Members must still receive treatment from qualified doctors within our group. PacifiCare: Members can get a second opinion in accordance with the specifications of the evidence of coverage (EOC) and disclosure form, as summarized below. A second medical opinion is a reevaluation of your condition or health care treatment by an appropriately qualified provider. This provider must be either a primary care physician or a specialist acting within his or her scope of practice, and must possess the clinical background necessary for examining the illness or condition associated with the request for a second medical opinion. Upon completing the examination, the provider’s opinion is included in a consultation report. Either the patient or the treating participating provider may submit a request for a second medical opinion. For additional information, please refer to evidence of coverage brochure. 8. Where are decisions made about specialist referrals, testing, treatment, surgery, and hospitalization? Aetna: For our delegated groups, the PCP makes decisions with their PMG/IPA. The health plan makes this determination for non-delegated groups. Anthem Blue Cross: Delegated PMGs/IPAs make decisions about utilization management approval and denial. The provider group’s medical director makes all denial decisions. Blue Shield of California: These types of decisions are made by our contracted IPA/medical groups, and involve Blue Shield if there is a question about appropriateness, or if a member is dissatisfied. Cigna: Primary and specialty care physicians make decisions about referrals, testing, and treatment. At times, they can coordinate care with their medical groups or IPAs. Hospitalization can require authorization from Cigna. Health Net of CA: A Health Net member’s participating physician group (PPG) authorizes all treatment, including specialty referrals for testing, treatment, surgery or hospitalization. A member with a chronic condition or disease requiring continuing specialized medical care is eligible for a standing referral to a specialist. A standing referral allows extended access to a specialist for members with life-threatening, degenerative or disabling conditions. The member’s PCP will refer the member to practitioners who have demonstrated expertise in treating a condition or disease involving a complicated treatment regimen requiring ongoing monitoring. Kaiser Permanente: The member’s primary care physician (PCP) makes the decisions about specialist referrals, testing, treatment, surgery, and hospitalization and does not need authorization to put these decisions into action. PacifiCare: Our contracted PCPs act as the single point of contact, resource, and consultation for all health services provided to members, including specialty referrals. We believe this approach promotes familiarity with the member’s medical history and permits a single physician to monitor the member through complete episodes of care. These physicians look at the whole medical picture, as opposed to looking at symptoms from a specialist’s point of view. This method reinforces a strong doctor-patient relationship, provides early detection of medical problems, and ensures that medical referrals are appropriate and necessary. 9. What criteria are used to authorize or deny specialist referrals, treatments, or tests? Aetna: There are a variety of reference tools, including Milliman and many that the plan has developed and copyrighted. A medical director must make all denials for medical necessity. In addition, the plan has adopted an external review process for all fully insured members. Anthem Blue Cross: Referral processes are delegated to PMGs IPAs. Provider groups are required to use evidence based utilization management criteria, which has been reviewed annually, approved, and adopted for use by their utilization management committee. If Anthem Blue Cross has a medical policy concerning a specific service, test or procedure, the provider groups are required to follow these policies. Once the information is received, an authorization determination is made by a licensed Blue Shield review nurse, based on medical necessity and through the application of Blue Shield’s approved review criteria and guidelines. Health Net of CA: Health Net utilizes established written guidelines, such as InterQual Clinical criteria, along with the Health Net Medical Policy Manual, clinical practice guidelines, and the Schedule of Benefits. Kaiser Permanente: Our doctors are not required to seek authorization for medical services so long as the medical specialty, treatment, or test is available within our plan. PacifiCare: We require our provider groups to demonstrate the use of appropriate medical management guidelines. We conduct annual reviews of written procedures and consider the following factors for cases that may not meet criteria: age, co-morbidities and complications, response to treatment, the psychosocial situation, and home environment. We use written criteria based on sound clinical evidence and specific procedures for applying the criteria to make utilization decisions. In addition, we apply objective and evidence based criteria and consider individual circumstances and the local delivery system. We require our delegated providers to do the same. 10. Are you monitoring the length of time for referral authorizations? What are you doing to reduce or eliminate delays? Aetna: Yes, timeliness of decisions is part of a monthly case assessment audit. Turn-around time is monitored by annual audits and quarterly report submissions. Audits and training are used to address performance gaps. Anthem Blue Cross: PMGs/IPAs must have systems to monitor utilization review activities. Anthem evaluates compliance with standards for regulatory and accrediting timeliness through annual on-site audits. If there are issues with non-compliance, the provider group is educated at the audit and a corrective action plan is requested. A subsequent audit is conducted in 180 days. Anthem also monitors this process through the member grievance process. Anthem and the PMGs/IPAs further evaluate this through provider satisfaction surveys. This survey is administered annually to a random sample of PMG/IPA members. The results are included in a medical group quality score, which is used with other quality metrics as the basis of a quality bonus. Groups with higher scores receive larger bonuses. Blue Shield of California: Blue Shield’s contracted IPA/medical groups are responsible for the timeliness of decisions about referral authorization. They must comply with our standard of two working days to get all necessary information for a non-urgent referral, one calendar day for urgent referral/treatment, and immediately for emergency care. Blue Shield-delegated oversight consultant nurses perform annual audits to ensure that standards for timeliness are met. An IPA/medical group that does not meet timeliness standards for utilization management must take corrective action. Cigna: Cigna works closely with physicians and medical groups to expedite referrals and measures customer satisfaction with the referral process on a regular basis. Health Net of CA: Yes, it is done through access audit reports, member satisfaction surveys, HEDIS indicators, physician profiles, medical group comparison reports and member complaints. Delays are remedied through corrective action. Kaiser Permanente: Our doctors are not required to seek authorization for member’s medical services. Practically every aspect of a member’s encounter with their health care team will later go through our internal utilization review process. If there are any factors found to be slowing the processing of referrals, steps are taken to remove or change those factors. Additionally, we require provider groups to submit for our approval all changes to their denial notices prior to issuance. The groups must submit utilization data at least quarterly. Where organized provider groups are the predominate system of care, we monitor quarterly provider information related to under-utilization, appeals and grievances to identify trends in delays or denial of service. 11. What are the criteria and processes for getting a referral to a specialist outside of the MG/IPA or plan? Aetna: Out-of-plan approval is done if one or more of these criteria are met: required services are not available in the group or network; required non-emergency service is available in the plan option, but is not accessible in reasonable timeframe; or the patient is a new member and was receiving services from an out-of-plan provider (reviewed on case-by-case basis). Anthem Blue Cross: If a needed specialty is not available in a signed PMG/IPA, the provider group arranges for the member to be seen by the appropriate specialist. The Anthem Transition Assistance Unit facilitates second opinions outside of the provider group when the member or provider requests it and a PCP or specialist in the provider group’s network has already seen them. Blue Shield of California: Personal physicians can refer patients out of the network with the agreement of the IPA/medical group or authorization from Blue Shield. Blue Shield is involved in referrals only when an IPA/medical group wants to refer out-of-network and not be financially responsible. The IPA/medical group would then contact Blue Shield for authorization and request that Blue Shield be financially liable. Cigna: A primary care physician can request a referral for service outside the medical group or plan when the service is not available. Customers can also contact Cigna directly to arrange a second opinion. Health Net of CA: Health Net’s contracted participating physician groups (PPGs) are delegated to provide member care, including all specialty referrals. 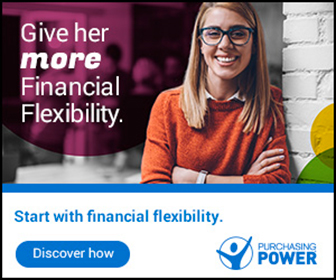 If the PPG does not have a particular kind of specialist with which it contracts, the PPG is still responsible to find a specialist out of its network for the member. The PPG has the financial responsibility for paying the specialist. The PPG may deny the request if it has a particular kind of specialist within its network and a member requests to see a specialist that is outside the PPG’s network. The member has the option to appeal the denial with Health Net. Kaiser Permanente: If a member needs specialty care not available within our plan the chief of the appropriate specialty service is required to research and approve the referral. With a large group of our specialists practicing in more than 75 specialties and subspecialties, we have been able to minimize outside referrals significantly so that our members do not need to leave the continuity of our in-plan care. PacifiCare: Our contracted provider network is comprehensive and provides a qualified specialist for every covered benefit. When a service is not available within a member’s provider group, the member receives a referral to a qualified provider or specialist outside the member’s provider group, but contracted with PacifiCare. Either the provider group or we will assess the medical necessity for these requests and authorize care as necessary. Referrals to non-contracted providers rarely happen, generally only in emergencies or for specialized services not available through a contracted provider; therefore, we do not track this statistic. Aetna: Chiro rider. Acupuncture is covered when administered. Anthem Blue Cross: We cover physical therapy, occupational therapy and outpatient speech therapy. Physical therapy and spinal manipulation may be performed by a licensed chiropractor if in the scope of their license. Blue Shield of California: Complementary medical disciplines that are available include: substance abuse rider; residential treatment rider; chiropractic care rider; acupuncture services; specialty dental care coverage; discount programs for chiropractic, acupuncture, and massage therapy; and vision supplies and services. Cigna: When medically necessary, some customers can access acupuncture and chiropractic services as a component of short-term rehabilitation. Other benefit plans offer homeopathic and naturopathic services as riders. In addition, Cigna’s Healthy Rewards program offers customers discounts on alternative/complementary medicine services and other health-related programs for acupuncture, chiropractic services, fitness club membership, hearing care/instruments, laser vision correction, massage therapy, vitamins, herbal supplements, non-prescription medications, and smoking cessation programs, among other programs. More information on the Cigna Healthy Rewards program is available to customers through their personalized online portal on mycigna.com. Health Net of CA: Health Net offers chiropractic and acupuncture benefits as supplemental benefit riders to its traditional medical benefit plans. The riders may be purchased with the HMO and POS medical plans. They are designed to complement the benefits plans, rather than replace them. The rider is only available to groups. A variety of benefit plan designs are available, including chiropractic only, acupuncture only, and a combination of chiropractic and acupuncture. Kaiser Permanente: Adding value to group health benefits and helping to reduce health care costs, complementary or alternative medicine (CAM) is part of our holistic approach to improving the health and productivity of our members. American Specialty Health Plans of California, Inc. (ASH) helps members with selecting services from a range of wellness disciplines that include acupuncture, chiropractic care, exercise centers, fitness clubs, massage therapy, and naturopathy. PacifiCare: PacifiCare of California does not offer alternative medIcine benefits as part of its design. However, all members have access to discounts on alternative medicine benefits through an affinity program. Employer groups can purchase supplemental plans that cover acupuncture and chiropractic benefits. 13. Do you cover blood tests for prostate cancer for non-symptomatic men? If so, at what age? Anthem Blue Cross: Yes, preventive care guidelines address the appropriate frequency of different testing schedules. We cover prostate cancer screenings including, but not limited to, prostate specific antigen (PSA) testing when medically necessary and consistent with good professional practice, regardless of age. Blue Shield of California: Yes, regardless of age. Cigna: Yes, for men over 50 annually or more frequently when medically indicated. Health Net of CA: Yes, as determined by the PCP. Kaiser Permanente: Yes, prostate cancer screenings are part of our basic coverage regardless of a man’s age, personal medical history, or the medical history of his family. Early detection of prostate cancer can lead to better outcomes. Members do not need a referral to make an appointment for a prostate cancer screening. PacifiCare: Yes, these blood tests are covered benefits. The member’s primary care physician determines the necessity of this and all other blood tests. 14. Do you cover mammograms for women with no history of breast cancer? Anthem Blue Cross: Yes, Anthem Blue Cross covers Preventive Services for our members in accordance with U.S. Preventive Services Task Force Guidelines. Blue Shield of California: Yes, with a personal physician referral. Cigna: Yes, for women over 40 annually or more frequently as directed by their physician. Health Net of CA: Yes, typically, every one to two years from ages 40 to 65+, but the PCP may authorize mammograms at his or her discretion. Kaiser Permanente: Yes, mammograms are part of our basic coverage regardless of a woman’s personal or family history of breast cancer. Early detection of breast cancer can lead to better outcomes, and having regular cancer screenings is an essential part of preventive medicine. Members do not need a referral to make an appointment for a mammogram. PacifiCare: Yes. Mammograms for women with no history of breast cancer are covered in accordance with U.S. Preventive Services Task Force Guidelines. 15. Do you have an open drug formulary? Anthem Blue Cross: Yes, Anthem offers a comprehensive formulary with various benefit designs. Options may include an open formulary, a closed formulary, and a selective or partially closed formulary. Blue Shield of California: The Blue Shield Drug Formulary is a list of preferred generic and brand name drugs that have been reviewed for safety, efficacy, and bio-equivalency, and are approved by the Federal Food and Drug Administration (FDA). This formulary is developed and maintained by the Blue Shield Pharmacy and Therapeutics (P&T) Committee, which meets on a quarterly basis. The P&T Committee consists of independently licensed physicians and pharmacists in community practice and who are not employed by Blue Shield. A drug prior authorization program is available for selected drugs on the formulary as well as for non-formulary drugs to promote appropriate first-line therapy or to reserve use of certain medications with specialized uses or significant potential for misuse or overuse. • A closed formulary plan provides coverage for generic drugs, formulary brand-name drugs, and specialty drugs. Non-formulary drugs and most specialty drugs are covered only when prior authorization is approved. • An incentive formulary plan provides coverage for generic drugs, formulary brand-name drugs, and specialty drugs. Non-formulary drugs are also covered for a higher co-payment. Prior authorization may be required to cover some specialty and certain non-formulary drugs. If coverage for a non-formulary drug requiring prior authorization is approved, the member is responsible for the non-formulary co-payment. Cigna: We traditionally use a closed drug formulary. However, employers can choose a three-tier or two-tier pharmacy plan if specified and agreed to in the contract. Health Net of CA: Health Net offers a 3-tier Recommended Drug List, an open formulary that includes most generics on Tier 1, recommended brands on Tier 2 and some generics and brands on Tier 3. Kaiser Permanente: No. We have found there to be greater medical and financial advantages to our established “closed” formulary program that provides physicians with drug treatments proven to be safe and effective. Our formulary is maintained and regularly updated by our doctors and pharmacists working in tandem with our Drug Information Services Team. The team independently analyzes data and reports on new drugs while doctors and pharmacists in our medical facilities research the effectiveness and safety of each. Whenever therapeutically appropriate, we include the generic forms of medicines in our formulary. We have a formulary compliance rate greater than 98% and approximately 80% of those prescriptions are for generic drugs (versus an industry average of 63%). This yields considerable savings given that generic medicines are about 70% less expensive than their equivalent brand-name versions. PacifiCare: No, we use several managed formularies at different tier levels, but we do not offer an open formulary. 16. If a closed formulary, what happens if a non-formulary drug is necessary? Anthem Blue Cross: Non-formulary drugs may be approved upon review through a prior authorization process when a medical need exists. Blue Shield of California: We have drug prior authorizations for selected formulary, non-formulary, and specialty drugs. The goal is to promote patient safety, appropriate first-line therapy for medical necessity manage use of specialized, high cost or highly addictive or habit forming medications, and help keep the cost of healthcare affordable. Physicians may contact Blue Shield pharmacy services directly through a toll-free phone or fax number to request prior authorization. Some drugs may be limited to a maximum quantity and require prior authorization if a given drug’s limit is exceeded. The P&T Committee may also determine that a certain quantity of a given medication may need prior authorization to review for medical appropriateness. All prior authorization requests are reviewed by pharmacists and pharmacy technicians to determine if the criteria approved by the P&T Committee for the requested drug meets the criteria for an exception. A coverage determination can be made via telephone within minutes if all required information is provided. Urgent prior authorization requests sent via fax are reviewed within three business days, while non-urgent requests are reviewed in no more than five business days. The member’s clinical information must be received by Blue Shield in order to start the review process. If the physician does not submit the required information, Blue Shield will send a follow-up request to the doctor. Delays sometimes occur if the physician does not provide the required information in a timely manner. If a non-formulary drug requiring prior authorization is approved under the closed formulary plan, the member is responsible for the applicable brand co-payment. If a non-formulary drug requiring prior authorization is approved under the incentive formulary plan, the member is responsible for the applicable non-formulary co-payment. If a request from a physician for a drug that requires prior authorization for medical necessity is denied, a denial letter is mailed to the member. Included with the denial letter is the reason for denial, alternative covered therapy, if appropriate, and the Blue Shield Appeals and Grievance procedures. The physician also receives notification of the denial along with a list of preferred formulary alternatives. Cigna: The customer or their physician can ask for an exception to get a non-formulary drug. Cigna’s clinical staff reviews the request. Kaiser Permanente: It is at the medical discretion of our doctors to prescribe any FDA-approved non-formulary drug if its use is in the best medical interest of the member. In these cases, the member would pay their usual cost-sharing fee as opposed to the full price they would be charged for a non-formulary medicine. PacifiCare: Medically necessary non-formulary medications can be approved through our preauthorization exceptions process. 17. Do you have an experimental/investigative exclusion? If so, how does it work? Aetna: Yes, for the welfare of our members, experimental or investigational procedures are excluded from our health plans. However, the exclusion would not apply with respect to services or supplies (other than drugs) received in connection with a disease, if we determine that: the disease can be expected to cause death within one year, in the absence of effective treatment; and the care or treatment is effective for that disease or shows promise of being effective for that disease as demonstrated by scientific data. In making this determination we would take into account the results of a review by a panel of independent medical professionals. They would be selected by Aetna. This panel would include professionals who treat the type of disease involved. Also, this exclusion would not apply with respect to drugs that have been granted treatment investigational new drug (IND) or Group c/treatment IND status; are being studied at the Phase III level in a national clinical trial sponsored by the National Cancer Institute; or if we have determined that available scientific evidence demonstrates that the drug is effective or the drug shows promise of being effective for the disease. Anthem Blue Cross: Yes, however, all treatment decisions are based on medical necessity as it applies to a member’s condition. A request would be denied for a procedure that is considered experimental or investigative for a member whose condition has no unique or discerning characteristics. The member can request an independent medical review if we determine that a requested procedure does not meet our medical necessity criteria. Our Corporate Medical Policy and Technology Assessment Committee evaluate new procedures for incorporation into benefit plans. Blue Shield of California: Yes, based on the BlueCross BlueShield Association assessment criteria for health outcomes, our formulary does not cover drugs that are considered experimental or investigational or that are not recognized in accordance with generally accepted medical standards. Cigna: Cigna medical directors make decisions about an experimental/investigational request based on medical literature, expert opinion, and the facts of the specific situation. Coverage positions are developed regularly, which assess emerging technologies. They are posted on our website. Physicians can access Cigna’s online health care professional portal to request reviews of technologies for which coverage positions have not yet been developed. Cigna also uses a formal independent expert review process when appropriate. • The member has a life-threatening or seriously debilitating condition. • The member’s physician certifies to Health Net that the member has a life-threatening or seriously debilitating condition for which standard therapies have not been effective or are otherwise medically inappropriate. • There is no more beneficial therapy covered by Health Net. • The member’s physician certifies that the proposed experimental or investigational therapy is likely to be more beneficial than available standard therapies. As an alternative, the member may submit a request for a therapy that is likely to be more beneficial than available standard therapies based on documentation presented from the medical and scientific evidence. Kaiser Permanente: Yes, we do. However, in keeping with our commitment to health care research, we take a systematic, evidence-based approach to evaluating and implementing new technologies and new applications of existing technologies. This helps ensure members have timely access to new safe and effective treatments. Our integrated health care delivery system enables the coordination of national and regional processes and provides the operational support and infrastructure needed to quickly and effectively review the broad array of new technologies being developed. At the local level, we’re able to deploy new technologies in pilot programs at our medical centers to obtain real-world data on outcomes and effectiveness. • It cannot lawfully be marketed without the approval of the Food and Drug Administration (FDA) and such approval has not been granted at the time of its use or proposed use. • It is a subject of a current investigation of new drug or new device (IND) application on file with the FDA. • It is the subject of an ongoing clinical trial (Phase I, II or the research arm of Phase III) as defined in regulations and other official publications issued by the FDA and Department of Health and Human Services (DHHS). • It is being provided pursuant to a written protocol that describes among its objectives the determination of safety, efficacy, toxicity, maximum tolerated dose or effectiveness in comparison to conventional treatments. • Other facilities studying substantially the same drug, device, medical treatment or procedures refer to it as experimental or as a research project, a study, an invention, a test, a trial or other words of similar effect. • The predominant opinion among experts as expressed in published, authoritative medical literature is that usage should be confined to research settings. • It is not Experimental or Investigational itself pursuant to the above criteria, but would not be Medically Necessary except for its use in conjunction with a drug, device or treatment that is Experimental or Investigational (such as, lab tests or imaging ordered to evaluate the effectiveness of an Experimental therapy). • The Member’s medical records. • The protocol(s) pursuant to which the drug, device, treatment or procedure is to be delivered. • Any informed consent document the Member, or his or her representative, has executed or will be asked to execute, in order to receive the drug, device, treatment or procedure. • The published authoritative medical and scientific literature regarding the drug, device, treatment, or procedure. • Opinions of other agencies or review organizations, e.g., ECRI Health Technology Assessment Information Services, HAYES New Technology Summaries or MCMC Medical Ombudsman. • Regulations and other official actions and publications issued by agencies such as the FDA, DHHS and Agency for Health Care Policy and Research AHCPR. • A Member with a Life Threatening or Seriously Debilitating condition may be entitled to an expedited external, independent review of PacifiCare’s coverage determination regarding Experimental or Investigational therapies as described in Section Eight: Overseeing Your Health Care, Experimental or Investigational Treatment. 18. Which requested procedures are denied most frequently based on experimental investigative or not medically necessary exclusions? Aetna: This information is not readily available. Cigna: This data is not available. Health Net of CA: The most frequently denied requested procedures are those that are not FDA approved/accepted in the medical community as standard, safe and effective. Kaiser Permanente: If a plan physician determines that a procedure or service is medically appropriate for a member and its omission would adversely affect the member’s health, then it is considered medically necessary. As a result, we do not consider a medically necessary service or procedure to be an exclusion. Additionally, we do not deny experimental or investigative procedures if they are considered medically necessary and appropriate for the member’s care. All procedures and treatments are reviewed on a case-by-case basis with the determination for care made by the doctor often in consultation with the chiefs of service for their own area of practice and other related areas of practice. PacifiCare: This information is not available. We do not track the number of most frequently denied investigational/experimental or not medically necessary procedures. We do track appeals and grievances. If a member appealed a denial, and it was due to one of the above reasons, we may be able to provide that procedure; however, it would not apply to our book of business. 19. What is the standard hospitalization for normal and a Caesarean birth? Aetna: The physician determines it. Blue Shield of California: The standards are two days for a normal birth and four days for a Caesarean. Health Net of CA: Standard hospitalization for normal birth is two days and four days for Caesarean birth. Kaiser Permanente: According to our 2012 HEDIS scores, in Northern California, the average length of hospital maternity stay for all types of births is 2.41 days and 2.48 days in Southern California. We no longer separately track hospitalization stays for C-section delivers. PacifiCare: The average length of stay is two days for a normal birth and four days for a Caesarean. 20. How many hospital days are utilized in a year for every thousand HMO members? Blue Shield of California: For HMO in 2011, our utilization for inpatient days per 1,000 was 168.37. Health Net of CA: 2011: 198.5 days per 1,000 HMO members. PacifiCare: Our total in-patient utilization in 2010 was 160.92 per 1,000 members. 21. What are your loss ratios, administration/medical? Blue Shield of California: For IFP plans regulated by the Department of Insurance (DOI), we spent 78.2% on medical and 21.8% on administrative, and we met or exceeded medical loss ratios for our IFP, small group, and large group plans regulated by the Department of Managed Healthcare (DMHC). Cigna: This information is publicly available through reports we submit to federal and state regulators. Health Net of CA: In 2011, the medical care ratio was 86.3% and the administrative loss ratio was 10.5%. Kaiser Permanente: Based on our 2011 DMHC Annual Report, our administrative loss ratio plan wide was 4.33% and our medical loss ratio was 94.63%. It should be noted that we no longer use the phrase “Medical Loss Ratio,” using instead “Medical Benefit Ratio” (MBR) whenever possible. Along with many others in health care, we feel that MBR is a more accurate and descriptive means of describing this important ratio. PacifiCare: As of December 31, 2011, our commercial medical loss ratio for PacifiCare of California is 85.4 percent. The administrative ratio is 7 percent. 22. Is your plan NCQA accredited? Aetna: Yes, Aetna Health of CA Inc is accredited and has got Quality Plus distinction in Care Management, Physician and Hospital Quality. Anthem Blue Cross: Anthem Blue Cross and Anthem Blue Cross Life and Health Insurance Company have achieved a Commendable Accreditation rating from NCQA. NCQA awards a status of Commendable to organizations with well-established programs for service and clinical quality that meet rigorous requirements for consumer protection and quality improvement. Blue Shield of California: Yes, the National Committee for Quality Assurance awarded Blue Shield its highest rating of Excellent Accreditation for Commercial HMO/POS products. Cigna: Yes, our HMO plan has received NCQA’s highest accreditation level of excellent. In addition, Cigna has earned NCQA’s Physician and Hospital Quality (PHQ) Certification. These standards assess how well a plan provides individuals with information about physicians and hospitals in its network to help them make informed health care decisions. Cigna has also earned an NCQA quality rating for its health and wellness programs, and all four of our behavioral health care centers nationwide have earned full accreditation from NCQA. Health Net of CA: Yes, Commercial HMO, PPO and POS lines of business have received the “Commendable” accreditation status from the National Committee for Quality Assurance (NCQA), and Health Net’s Medicare HMO received the excellent accreditation status. Kaiser Permanente: Yes, we are. As of the third quarter of 2012, all of our service areas across the country have NCQA ratings of excellent, their highest possible rating, for our HMO and Medicare lines. PacifiCare: Yes. PacifiCare of California maintains an excellent accreditation rating. Now that the Supreme Court has upheld the Affordable Care Act (ACA), the health insurance brokers must find solutions to complex business challenges, rather than simply selling a product. Toward this end, many brokers are seeking new strategies to differentiate themselves in the marketplace and develop the expertise to leverage new opportunities. • Get up to speed on the advantages of a health plan management partnership. • Be well prepared to help clients meet ACA deadlines. • Participate, as appropriate, with state or private exchanges. • Comply with the medical loss ratio (MLR) provision. With self-insured plans, commissions can be customized. Also, plan sponsors or employers can offer uniform benefits across state lines so that all employees, in a particular class, are treated equally. With self-insured plans, employers can create their own benefit designs, such as making certain expenses ineligible or limiting benefit amounts. Also, the reinsurance market is more competitive and active compared to the conventionally insured market, creating more opportunities for savings. 1. Specific stop-loss insurance protects the employer in the case of a catastrophic claim from an individual. 2. Aggregate stop-loss insurance protects against claims that exceed the contracted amount for the entire group. There are key advantages to self-insurance plans. Since self-insured health plans are regulated under federal law (ERISA), they are not subject to conflicting state health insurance regulations and benefit mandates. In addition, self-insurance plans are not subject to state health insurance premium taxes, which are generally 2% to 3% of the premium dollar. They offer control over insurance programs, thereby improving cash flow and maintaining company health plan reserves for investment. Self insured plans also reduce plan operating costs. Self insured plans also offer accessible claims reporting packages. With guidance from a healthcare management partner, health insurance brokers can develop marketing seminars to target prospects and demonstrate their ability to think outside of the box. • Adjudicating and paying claims. • Negotiating, obtaining, and renewing stop-loss placement. • Conducting enrollment information meetings. Arranging managed care services, such as access to preferred provider networks; coverage for alternative treatment programs including acupuncture and chiropractic services; prescription drug card programs that offer cost-saving opportunities; and utilization review. Look for a health plan management firm that offers secure data analytics for both remote and real-time care. The firm should also provide an inexpensive vehicle for coordinating online tools that identify at-risk members and their patterns and treatments for various ailments – from diabetes to heart conditions. Robust data analytics allow self-insured employers to evaluate employee information (age, chronic illness, risk factors); evaluate gaps in care; update medical conditions; compare previous costs to projected expenditures; and intervene with optimal prevention and wellness programs. The ACA offers several opportunities for increased sales through 2013 including tax credits for small companies, an individual mandate requiring citizens to carry medical insurance, and an employer mandate requiring minimal coverage. As more complicated provisions kick in during 2014, employers will increasingly need the indispensable guidance of their brokers when it comes time to purchase medical insurance. • September 23, 2012 – The Summary of Benefits and Coverage (SBC) requirement becomes effective, depending on whether a plan has an open enrollment period and its timing. Significant sanctions are to be imposed for failure to provide the SBC. • January 1, 2013 – Effective date for reporting the cost of employer-provided coverage. • ACA limits employee contributions to Flexible Spending Accounts (FSA) to $2,500. • Increase in Medicare taxes for “highly compensated” employees. • March 1, 2013 – Employers must give employees written notice of the existence of health insurance exchanges in their state. • January 14, 2014 – Play or pay mandate goes into effect. Businesses with more than 50 employees face penalties if health coverage is not offered to full-time employees or the coverage offered is unaffordable or not comprehensive. The ACA will allow states to organize their own health insurance exchanges. The health industry can expect to see an estimated $4 billion annually with 22 million people expected to buy insurance through the exchanges and a conservative $15 per person per month commission for private brokers. These state-based marketplaces are expected to be up-and-running by 2014. Brokers can also find opportunities working with the nonprofit insurance pools funded by the new legislation. These co-ops will be looking to identify third-party administrators and other services, so brokers are well positioned to serve as a guide by explaining details, establishing stop-loss coverage, paying close attention to customer needs, and conducting research on their behalf to help set up the co-op. The medical loss ratio (MLR) provision requires insurers to spend 85% of large group revenue and 80% of individual and small group revenue on healthcare and quality improvement efforts. Health insurers are citing this provision as a reason to slash producer commissions or eliminate them altogether. Since self-insured programs are not subject to the MLR requirements, clients and their brokers are free to build in a fixed amount of compensation, per employee, in order to stabilize commissions, even if total plan costs decrease. This creates a win-win proposition for small companies and brokers, who are fairly compensated for the value they add while their clients gain greater control over healthcare costs. In the new reform environment, health insurance brokers who present a broader set of financing options to their customers will set themselves apart from the competition and will allow their customers to adapt their programs like never before. Despite the extensive changes and potential challenges created by the ACA, brokers who stay current, agile and open to new business strategies will do more than survive – they will thrive. Joseph Berardo, Jr., is CEO and president of MagnaCare. Being proactive for your business-owner clients is paramount in today’s retirement and tax planning arena. The more options we have in our tax and retirement planning toolbox, the better value we can deliver to our clients. Legislative changes, over the past decade, have led to a dramatic reduction in non-qualified plan options. But one option can still deliver tremendous value to some business owners – the Section 79 plan that’s funded with permanent life insurance. These plans can be used in place of qualified plans or stacked on top of qualified plans. Section 79 plan benefits do not affect the benefits provided under qualified plans. A common planning issue is that defined benefit pension plans have been problematic for business owners that have too many employees or perhaps the employees are highly paid and/or older. This happens quite often in industries, such as the medical profession. With a defined benefit pension plan, the cost of providing substantial benefits to employees diminishes or even negates the business owner’s tax savings and just does not make economic sense. Or an employer may have maximized the existing defined contribution plan. Many financial planners and insurance advisors are familiar with IRC Section 79 in regard to group term plans. This code section sets forth the rules for employer-sponsored group life, health, and medical insurance. An employer may provide up to $50,000 of group term life insurance for employees without any cost to the employee. The employer can deduct the cost under Section 162. However, the employee does not have to include the cost as taxable income in that year. • They enjoy a tax deduction or reduction. Not all of the money that’s contributed to permanent insurance under the Section 79 plan must be included as taxable income in the year each contribution is made. • They can benefit from the policy’s tax-deferred saving feature. • There is the ability to generate tax-free income through policy loans. • There is a significant amount of long-term life insurance protection. • Contribution amounts can be adjusted annually, if needed, to provide flexibility for the business. However, specific requirements must be met to fund benefits utilizing permanent insurance under Section 79. The benefits must be based on a formula that precludes individual selection. Treasury Regulation 1.79 includes the formula for calculating what participants report as taxable income – the cost of the permanent benefit plus the cost of the deemed death benefit. In most cases, $50,000 of the death benefit may be excluded from income. In a properly designed plan, the participant’s reportable income can be only 60% to 80% of the premium actually paid by the corporation. Not only does the corporation get a 100% tax deduction for the contribution, but also the individual reduces their taxable income! The plan can be tailored for companies with multiple owners and/or highly compensated employees – not all of whom may participate or may participate at different funding levels. Section 79 plans don’t have the same minimum participation rules as do qualified plans. In non-discriminatory plans, ancillary employees are entitled to permanent insurance funded by the employer. However, most don’t choose to participate at this level. The long-term benefits must be explained to employees. Many, if not all, will opt out. The participant has to include phantom income for each year a contribution is made; pay taxes on that income; and go through medical and possibly financial underwriting. Employees who opt out of the permanent benefits will receive a group term benefit up to $50,000, which we call the “free benefit.” So the cost for employees is extremely low in many cases. In addition, the Section 79 plan can offer a powerful way to attract and retain highly compensated employees. Corporate entity structure plays an important role in designing Section 79 plans. In most cases, for an owner’s contribution to be deductible, the sponsoring entity should be a C corporation or an LLC that files as a C corporation. The owner must own less than 2% of a pass-through entity, such as an S corporation. In many cases, when the main company is a pass-through entity, a C Corporation can be used as the sponsoring entity as long as it is a real and viable entity with a distinct business purpose. Brother/sister control group rules and affiliated service group rules are not a problem since employees in the main entity are covered and not excluded. One major area of confusion surrounds Section 79 plans and listed transactions under 6707A. In at least one instance, an advisor grossly misreported that Section 79 plans can be considered a listed transaction. At the time of the writing of this article, Section 79 plans have never been an item on that list. For a complete listing of transactions covered under 6707A, refer to the IRS website at www.irs.gov. In specific planning situations, a Section 79 plan is a powerful tool in our tax and retirement planning toolbox for providing tax savings at the corporate and personal level, significant tax-free supplemental retirement income, and substantial survivor benefits to the successful business owner or professional. The value it can deliver in specific planning situations cannot be understated. Brian Hartstein, MSFS, CLU, ChFC chief executive officer of Economic Concepts Inc. For more information, visit www.ecico.com. Employers turn to latest trends in concierge benefits to improve employee retention amongst Millennial generation of 18 to 28-year olds. These touch-screen tapping, instant-messaging, multi-taskers have grown up in a world of friending, trending, Googling, and Facebooking. They are Generation Y, or “Millennials,” and it is estimated that by 2025, they will make up roughly 75% of the world’s workforce. While managers are often impressed by Millennials’ innovative ideas, time-saving process improvements and collaborative spirit, employers often struggle with this generation’s sense of entitlement, need for instant gratification, and lack of long-term job commitment. In fact, about two-thirds of Millennials said they would likely surf from one job to the next and 44% said they would blow off a job acceptance commitment if a better one presented itself, according to a recent study of 18- to 28-year olds published by Michigan State University and Monstertrak. This sentiment, which seems to be representative of the majority of Millennials, has led to a new wave of work/life blending over balance. Seeing that today’s employee has an average of at least 15 co-workers friended on Facebook, the line between work and personal life is definitely blurred. They may be Skyping with Mom midday while answering work emails at midnight. Millennials are also less likely to be defined by one job or one career than are their Gen X and Boomer counterparts. They often simultaneously pursue a variety of entrepreneurial, part-time, and side projects in search of that perfect-fit career. Employers may be surprised to find that their part-time administrative assistant is also a sought-after fashion blogger who teaches art to autistic teens on weekends. Millennials want flexible, tolerant, and supportive work environments that value their contributions while allowing them to pursue a variety a personal and career goals. Having watched their parents lose their “secure” eight-to-five jobs, 401Ks, and retirement funds and even their homes, Millennials are not afraid to make their personal lives top priority. A 2010 study conducted by the Pew Research Center revealed that on a scale of importance, 52% of Millennials ranked “being a good parent” highest, followed by 30% who said “having a successful marriage,” and even 21% said “helping others in need.” “Being successful in a high paying career,” however, came in at a low 7%. Now, many U.S companies are left wondering exactly how much Millennials’ priorities and work styles differ from past working generations and what it means for recruitment, retention and employee benefit strategies. Issues arise if a job begins to interfere too much or demand too much. Millennials often become frustrated, and like an outdated piece of technology, will deem the job obsolete and move on to something fresher and more fulfilling. Administrative Officer Gil Manzano. If an employee makes $60,000 per year, then the replacement costs could be as much as $38,000 for that one employee. Multiply that by several employees each year, and you’ve got a seriously impacted bottom line. Companies that are trying to maintain a competitive edge must become Millennial-friendly. The corner office, prestigious title, and promises of a 5% annual raise are no longer incentives that speak to the growing Millennial workforce. In fact, while workers of all ages increasingly seek workplace flexibility, the 18- to 34-age group is up to three times more likely than older workers to give up more than 10% of their salary for more flexibility at work, according to a Harris Interactive survey undertaken on behalf of Mom Corps. Clearly, investing in employees’ well being and personal fulfillment is more important than ever. Not surprisingly, one of the companies that caters best to Millennials’ work style is Google. With on-site hair salons, swimming pools, a coin-free Laundromat, and even language classes included in the corporate benefits package, Google is well known for its creative recruitment and retention strategies for top talent. Of course, not all companies can afford Google’s unique benefit package. But companies of all sizes can get creative with a more practical benefits solution: corporate concierge programs. While many corporate concierge programs offer their services online or from a remote location, others offer the next level of convenience through the perk of on-site services. This can include anything from on-site car washes while the employees work, food delivery services, personal shopping, movie ticket sales, and everything in between. Even more convenient is the in-house corporate concierge. Having the ability to stop by the concierge desk in the morning on the way into work with a request for designing and planning a cocktail party, only to leave the office eight hours later with the necessary spirits and h’ordeuvres, a customized music playlist, and a handful of trendy party gifts would fulfill any Millennial’s work/life balance requirements. Left to their own devices, most Millennials, and employees in general, would manage this to-do list from their desk on company time or spend their lunch hour running errands. Although the corporate concierge program resonates strongly with Millennials’ “What can you do for me now?” attitude, it is an efficient tool for retaining employees of all generations, professions and perspectives. Companies can rest assured that a concierge program will keep all generations of employees happy and productive, but most importantly, that it will keep them at work. Dr. Ann D. Clark is CEO and Founder of ACI Specialty Benefits, a Top Ten EAP and leading provider of concierge, wellness, student assistance and work/life services. A best-selling author, Dr. Clark is one of the original Certified Employee Assistance Professionals (CEAP) and a licensed Marriage and Family Therapist. She can be contacted at aclark@acispecialtybenefits.com. Those who follow the health care reform saga may be aware that the vision care industry has had its own role in the discussion. In California, state lawmakers have sent two bills (SB 951 and AB 1453) to the governor, which identify essential health benefits for individuals and small businesses starting in 2014. Vision screening for kids has been included as an essential benefit. However, the California Health Benefit Exchange has voted to bar stand-alone vision plans from offering coverage in the exchange at least for the first year. Regardless of how these issues are ultimately resolved, with enrollment right around the corner, benefit decisions for 2013 are well underway. Promoting the importance of the vision benefit now makes a lot of sense. Many brokers recognize that a quality vision benefit can be a powerful player in the quest to keep employees healthy and productive. It can also help brokers differentiate their business by providing proven strategies that don’t require a massive, expensive overhaul of their clients’ benefit programs. To get a broker’s take on vision benefits, we interviewed Patrick Tibbs with Everence Financial Services, who is winner of the Transitions Vision Benefits Broker of the Year Award. The award is sponsored by Transitions Optical. Has the passage of the Health Reform law had any negative effect on vision plan sales? No, in fact, it has created an opportunity to generate a conversation about vision and the role it can play in an organization’s benefit package and wellness strategy. It’s more important than ever for brokers to include vision in their dialogue with HR clients. Why is now a good time to promote vision benefits? Vision plans boost an employer’s bottom line in three ways. First, a vision plan can be part of a wellness strategy that helps manage health care costs though early disease detection. For example, an employee who finds out that they have diabetes from their eye exam may take the steps to curb the effects of the disease before they become more costly and detrimental to their health. The cost of treating diabetes and its complications is a heavy burden on employee health plans. More than 10% of all U.S. health care costs in 2002 went to treat the disease and its associated complications. By 2050, the annual cost will top $132 billion. Additionally, more complex and costly diabetes treatments are being applied to an increasing population, according to a 2008 study published in the Archives of Internal Medicine. Second, a vision plan can improve productivity. A study by the University of Alabama at Birmingham (UAB) School of Optometry reveals that, even when computer users have a vision miscorrection that’s too small for them to notice, their performance can suffer by as much as 20% on certain tasks. Third, HR managers are always looking to enhance their benefit plans to attract and retain employees. And vision is a key ingredient, according to studies by organizations like MetLife and Jobson Optical Research. In fact, 84% of employees say that having a vision benefit is important to them. Employees also care about the quality of a vision plan. Nine out of 10 employees say it’s important for their vision plan to include advanced lens technologies, according to the 2012 Employee Perceptions of Vision Benefits survey by Transitions Optical. Also, a focusing on vision allows brokers to differentiate themselves from the competition, boost client retention, and create a door opener with prospects beyond the typical, “I can save you money on your health insurance” outreach. When you are discussing the benefits of a vision plan, what resonates most with your clients? Naturally, clients want to know about the cost. This can mean a number of things, such as how much of the premium the employer will need to contribute to the plan, how much staff time will be used to educate and enroll employees, and whether the benefit will be affordable to employees who face economic difficulties. In the case of vision, clients are pleased to learn that the costs are typically quite low and that education doesn’t need to be complicated. They also really listen when I point out that an eye exam may be the only regular visit that an employee or family member makes to a physician, so it can be a powerful screening tool and way to address vision issues. Finally, I emphasize that a vision plan can help employees and their families reduce out-of-pocket costs for eye exams, glasses, and contacts. I remind them that they can take advantage of their health savings accounts and/or flexible spending accounts for expenses that may not be fully covered by their plan. What do you look for in the vision plan carriers that you would recommend to your clients? I look for a broad network of providers, a variety of plan options, exceptional customer service, user-friendly Internet services for administration, and competitive rates. What kind of materials do you use to educate clients and/or their employees about the value of their vision plan? For both clients and employees, I think it’s important to include a clear description of the benefit, such as a one-page summary that outlines covered services and materials, premiums, and any out-of-pocket costs that the employee will experience with and without the vision plan. In addition, I always include a provider listing to demonstrate ease of access to nearby eye care services. I also make sure to discuss the preventive benefits of regular eye care and the proper eyewear. I’ve found interactive online tools that illustrate this effectively. For clients, I use the Healthy Sight Calculator (healthysightworkingforyou.org), which demonstrates how a quality vision benefit can help employers reduce health care costs and productivity losses. I also share the individual version of this tool (healthysightcalculator.org) to help employees understand how their age, gender, and ethnicity may affect their eye health risks and how much their vision plan could save them. How do you engage your clients in the eyewear side of the benefit? Are employers interested in plans that cover more than just basic eyeglasses and contacts? Eyewear technology, design, and quality are all important to vision plan participants. They just need to be educated about the options and to understand how the right eyewear actually affects the long-term health of the eye. For example, the photochromic lens is one of the most significant and overlooked eyewear options available today. These lenses offer abundant health benefits, such as protecting employees’ eyes from harmful UV light. Long-term, unprotected exposure to sunlight can lead to age-related conditions that compromise eye health, such as macular degeneration and cataracts. By adapting their level of tint outdoors, photochromic lenses also protect employees’ eyes from glare, which can lead to eyestrain and headaches and can even be dangerous in some situations. This is why I include and promote photochromic lenses in every vision plan I sell. It really gets everyone’s attention. As for employers, I’ve found that they are open to more quality level plans, in part, because their employees are requesting more choices. Employees who feel good about their plan are more likely to seek the eye care services and products that they need to supplement their eye and overall health. What is more popular among your clients – voluntary or employer-paid plans? A higher percentage of my clients have offered vision plans as a voluntary benefit. However, I do have employers with 10 or fewer employees who have embraced a 100% employer-paid plan. Do you present vision plans on their own or with other benefits, such as dental? I have typically presented vision plans with health or dental. I just started offering vision as a standalone benefit as well. How has your agency benefited from selling vision plans? Vision plans have allowed us to add a layer of preventive care to employer benefit packages, helping reduce out-of-pocket costs for not only the employer, but also for employees and their families. In turn, this has helped us with client retention and given use opportunities to bid on other benefits with the employers. What is your biggest challenge when promoting vision and how do overcome it? My biggest challenge is helping potential clients realize the positive effect that a vision plan can have on their benefit package. I educate organizations and HR managers on how a vision plan can be a solution to multiple employee benefit concerns. Easy, online tools or white papers that discuss vision plan return-on-investment can be shared with clients before or after a sales meeting to help them realize all the ways that uncorrected vision problems and eye-related health conditions can contribute to staggering health care costs and lost productivity. What would you say to other brokers who have been hesitant to dedicate much time to promoting vision benefits? I encourage them to take a second look at vision benefits. A quality plan – one that includes both a full eye exam and eyewear options to address vision issues – can truly benefit their clients and their workforce, at a very low cost. And don’t be afraid to stand out from the competition by offering easy employee educational tools, keeping up with the managed vision care issues in the news, and being prepared to answer employer questions about some of the latest advancements in eye care and eyewear technology. It’s well worth the effort. What makes you feel so strongly about the importance of eye care and eyewear? I was diagnosed with ocular hypertension during a routine eye exam 10 years ago. I learned that ocular hypertension (above-normal pressure in the eyes) could lead to glaucoma and possible vision loss. By detecting the condition early, my eye doctor and I have been able to take steps to keep it from progressing. Also, several years ago, my youngest son, Nick, experienced visual tracking issues. Nick was diagnosed with an autism spectrum disorder that was affecting the development of his language and visual skills. According to the Children’s Vision Information Network, approximately one in five school-aged children struggle to read. -Unfortunately, many are diagnosed with a learning disorder when a vision problem is the culprit. Our family optometrist gave us a visual tracking kit for Nick, and his tracking skills improved within one year. Nick’s learning development would have been further delayed if he had not received an annual eye exam. In addition to regular eye exams, proper eyewear plays a key role in effective eye care. It’s important for employees to take advantage of their vision plan’s eyewear options, especially those that protect against damaging UV rays, glare, and trauma. Most people are simply not aware of their options and how the right eyewear can enhance their vision and protect their eye health. 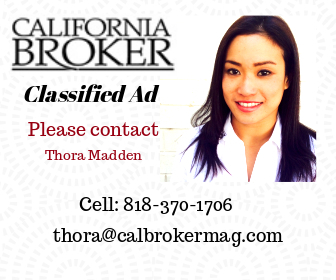 Leila Morris is senior editor of California Broker Magazine. Picture this – a world where it’s easy for an employee’s primary care physician (PCP) and their optometrist or ophthalmologist to share clinical information and claims data. When the left hand knows what the right hand is doing, both hands work together to take care of the body to which they are connected. In one scenario, after three years, an employee finally visits their PCP because their eye care professional raised concerns about diabetes. As a result, the PCP is able to address a serious medical issue. In another scenario, an employee gets additional screenings after their eye care professional reviews clinical information about a recent high blood pressure diagnosis. Vision benefits may not be the biggest part of a benefit package and they aren’t as complicated to design compared to medical benefits. But many agree that a vision benefit is an essential component of a health care benefit package. Vision plans tend to drive more frequent visits to eye care professionals who can identify a variety of medical conditions during the vision exam. Earlier identification and engagement can help reduce longer-term healthcare costs and improve patient outcomes. Making sure that the medical plan and the vision plan work together is crucial to a holistic healthcare model. The vision plan claims data and clinical data must be easily available to the medical plan. By the same token, the patient’s the eye care professional should have access to relevant health history and critical clinical information when the patient arrives at the office. Working together and sharing information is child’s play when the same insurer offers medical plans and vision plans. The complex coordination of care between vision and medical plans holds a hidden bag of goodies when it comes to managing an employee’s health. Having key clinical data easily available to health care providers can make a big difference in the care that employees receive. The employer can also benefit by reducing the number of claims due to early detection, prevention, and better management of health conditions. But sharing information might not be easy when the two plans are owned by separate entities. Separating the ownership between a medical and vision plan exposes an invisible cost as plans try to juggle disparate data and claims systems to manage chronic or acute medical problems. In fact, the confusion of whom to bill and what to bill is apparent as separately owned plans trade Explanation of Benefits (EOB) forms with each other to determine the next step in care. This invisible cost is not often considered when evaluating the best vision care model for a client. If care is too segmented, individual vendors might not be able to communicate easily enough to ensure coordination of the employee’s overall health care. And coordination of care is paramount with the cost of chronic disease management rising constantly. So, when you sit down to introduce product offerings to your clients, you should take some time to talk about all of the costs of doing business with standalone medical and vision plans. It’s no secret that employers want quality health and vision benefits at the best prices. And employees want the best care they can get with their benefits. The good news is that medical and vision plans are constantly looking at how to work more effectively with each other. Dr. Richard Hom is the National Optometric Director for WellPoint Vision and is also a retired US Army Officer. He earned a Doctorate of Optometry from the University of California at Berkeley and a Master’s degree in Public Administration from San Francisco State University. Dr. Hom has held positions in public policy, program management, print journalism, social media blogging and computer product management. Additionally, he is an advanced communicator and leader in Toastmasters. He currently resides in Northern California. In 2010, there were 40.3 million Americans 65 years or older – the highest number of seniors since the Census Bureau began keeping records more than a century ago. By 2030, there will be about 72 million older Americans – more than twice their number in 2000. In the year 2000, people 65 and older represented 12.4% of the population. This demographic is expected to grow to 19% by 2030. Bringing these numbers home, California is the state with the largest number of residents over 65, with 4.2 million. The aging of America is being felt in every aspect of society – from housing to transportation to business. Nowhere is it more pronounced than in our nation’s healthcare system, which must confront two indisputable facts: With Baby Boomers turning 65 at a rate of about 10,000 a day, more people are entering the senior ranks than ever before. And they’re living longer than any prior generation thanks to sophisticated medical technologies, healthy lifestyles, and new drug discoveries. In fact, the likelihood that an American who reaches 65 will survive to 90 has nearly doubled over the past 50 years – from just 14% in 1960 to the current 25%. By 2050, 40% of 65-year-olds are likely to reach age 90. What all this spells for brokers is opportunity. Seniors buy health insurance with a different mindset than when they were younger. To the commercial population, buying health insurance is akin to buying auto or home insurance – anticipating the unexpected and being prepared. But the decision of which insurance to purchase is of heightened importance to seniors who know that they are likely to consume healthcare resources more often than do their younger counterparts. Except for the small percentage who continues to be covered under an employer plan, seniors have two primary options for their health insurance. The first is to remain on Medicare with or without a supplemental plan to reimburse (at least in part) what Medicare doesn’t cover. The other is to join a Medicare Advantage plan that provides all of the benefits of traditional Medicare along with a host of additional benefits including transportation, vision care, dental care, and case management, depending on the plan. Because many of these add-ons offer true value and worth, Medicare Advantage plans continue to grow in popularity and enrollment. A record 13 million Medicare beneficiaries are enrolled in such plans representing 27% of all Medicare recipients. Enrollment jumped by more than one million from the previous year and increased in every state except Alaska and New Hampshire. As we move into the latter part of 2012, it’s never been better for California’s brokers to jump on board. That’s because the Medicare open enrollment period for 2013 runs from October 15 to December 7. That window is the only time when most seniors and the disabled on Medicare are able to determine whether their current Medicare coverage is working for them. Those who feel that they may get better healthcare at the same or a lower premium by switching from their traditional Medicare or from their Medicare Advantage plan can only make a change during this window. Who better to turn to for advice on this important decision than a trusted and experienced health insurance broker? A special-election period continues all year long for dual-eligible members (MediCal and Medicare), which provides even more opportunities for brokers to help seniors in the selection process. In addition, people age in to the Medicare market all year long at the rate of one every eight seconds! They have a seven-month window to make their initial coverage selection – beginning three months before their 65th birthday and ending three months after. Savvy brokers monitor their book of business to track when a client is turning 65 and they are ready with the necessary information about their client’s Medicare options. Baby Boomers are the first generation that, on a large scale, may have experienced managed care as a way of life. Many of these new seniors are more sophisticated than the generation before them when it comes to shopping for health coverage and asking intelligent questions about Medicare Advantage plans. They may have also helped their parents navigate the Medicare maze. That makes it even more incumbent on the broker to truly understand Medicare Advantage plans so they can help their clients determine which model is right for them. Medicare Advantage plans are offered by private insurance companies approved by Medicare, which, in turn, pays these companies to provide health services to those who enroll. These plans cover all of the services that original Medicare covers (except hospice care) and must follow rules set by Medicare. Most of these plans also include Medicare prescription drug coverage. In many ways, Medicare Advantage plans can be viewed in much the same way we view health insurance exchanges: Seniors who are moving in this direction are using the same fundamentals that the commercial market uses when shopping through an exchange. This includes having multiple plans from which to choose, a single point of coordination, and varying benefit levels and costs. It is then up to each shopping consumer to look at each plan to find the one that best meets their needs based on provider network, benefits offered, and cost. Similar to what has been seen in the commercial exchange marketplace, what seniors need most to make an intelligent decision is access to unbiased and understandable information. One way to get this information is through a dynamic search engine that allows seniors to view all of their options side-by-side. Through online resources, such as Joppel.com, seniors can go through a simple needs assessment and narrow down hundreds of plans through criteria that is specific to them, such as which medications are covered, the co-payment, and the provider network. This online resource is complemented by live, telephone customer support. A second approach (often done along with the first) is to sit down with a broker who has a CMS approved quoting engine and can explain how different types of Medicare Advantage plans, special needs plans, and other options compare to traditional Medicare. Seniors are bombarded with television commercials, direct mailings, and in-person presentations from Medicare Advantage plans all vying for their business. So there is a sense of confidence, security, and trust in speaking with a broker who has their best interest at heart. This is especially true of seniors who have had a history of working with brokers when they were part of the commercial market. The bottom line is that starting this month, 4.2 million Californian’s will have a short period of time to make a critical decision. Smart brokers are positioning themselves as the go-to source so they can capitalize on the tremendous revenue stream that the Medicare marketplace can bring. • Establish a competitive system to reduce Medicare overpayments to private insurance companies, saving Medicare more than $100 billion over 10 years. The ACA will also invest in fighting waste, fraud, and abuse. Together these proposals will extend the financial health of Medicare by five years. • Provide low- and middle-income seniors a 50% discount on brand-name drug and biologic prices to address the more than eight million seniors who annually hit the donut hole, or gap in prescription drug coverage in Medicare Part D.
• Eliminate deductibles, co-payments, and other cost-sharing for preventive care, and providing for free annual wellness check-ups. • Create a voluntary long-term care insurance program that provides a cash benefit to help seniors and people with disabilities get services that enable them to remain in their homes and communities. • Invest in innovations to improve the quality of care, such as medical homes and care coordination. • Promote coordinated care after discharge from the hospital and encourage investments in hospital discharge planning and transitional care to ensure that avoidable readmissions are prevented. • Developing and reporting quality of care measures across the healthcare delivery system to help beneficiaries make more informed choices of providers. • Focus on quality improvement to move our health system toward rewarding better care rather than more care. Brokers who take the time to understand the ramifications of this law and who can explain it simply and clearly will find willing listeners throughout the senior community. Seniors are not a homogeneous group; an 85-year-old is quite different than someone who just got on Medicare. Brokers must have the best tools that appeal to both audiences if they are going to be successful in this marketplace. For the older senior, the traditional means of buying insurance still apply – kitchen table conversations, local seminars, direct mail, and personal referral. On the other hand, Baby Boomers who are entering their senior years will be looking to their laptops, smartphones, and tablets for the information they need. They will be doing their own research, comparing prices, educating themselves on possibilities, and chatting with their friends who are likely facing the same decisions. Smart brokers are finding ways to join the conversation by speaking with potential customers through their media of choice. Are you on Facebook, Twitter, or LinkedIn? At the end of the day, it is the broker, more than anyone, who can provide the information and unbiased recommendations that older and younger seniors need in order to make well-informed decisions. In that regard, the broker’s role is the same as it has always been. And, like always, those able to seize the opportunities will end up winners. Kyal Moody is senior vice president of Joppel by HealthCompare, an online resource available through the Word & Brown Individual Division and expressly designed to help consumers and brokers easily evaluate, compare and enroll in private insurance plans participating in the nation’s Medicare program. Open today’s paper or browse your favorite online news source and most headlines tell a story of doom and gloom. Everywhere, people are feeling the pinch. From Wall Street to Main Street, people are worried about jobs, benefits, financial security – and the future. According to the U.S. Department of Labor’s July report, the unemployment rate remains unchanged at 8.3%; U.S. Courts Bankruptcy statistics reveal that bankruptcies are on the upswing, and the RealtyTrac U.S. Foreclosure Market Report for July 2012 shows the number of foreclosures remains high. Three out of four full-time employees experienced at least one legal life event in the past 12 months. Life’s financial complications have increased legal needs as well, according to a recent study conducted by Russell Research and commissioned by ARAG, reports. Leading brokers are finding new opportunities in the anemic economy by offering clients voluntary legal and financial solutions. Employers are always looking for cost-effective ways to manage business expenses. Yet, they also recognize the importance of providing value-added benefits. Voluntary benefits, like legal and financial solutions, allow the two strategies to work together while moving the business forward. Recent research supports the case that voluntary benefits improve workplace engagement and production. A recent Metlife study reveals that 86% of employers say that benefits can greatly increase employee productivity. And according to an Aflac study, 60% of employees said they would acquire voluntary benefits. Leading legal providers allow your clients’ employees to choose from a comprehensive array of benefits packaged to fit their needs and based on how they prefer to handle legal issues. Employers pay nothing while employees gain access to a network of attorneys and other legal resources for an affordable rate. Legal plans or other value-added voluntary benefits help employees address personal needs and objectives while keeping benefits costs down. During the continued weak economy, differentiation can be a matter of self-preservation – whether you’re talking about a broker or a business owner. Commission shrinkage has become a troubling trend as more employers buy down benefits. As a result, the competition for a finite number of clients has become infinitely more intense. More than ever, providing professional expertise, counsel and products that serve client needs can be critical elements for brokers to build strong client relationships and nurture business growth. Brokers who offer legal plans stand out from the crowd with a unique and valuable product offering. For employers, legal represents a cost-effective voluntary benefit and a strategic business asset that can affect the business bottom line by helping reduce employee stress, absenteeism and presenteeism. This, in turn, promotes higher productivity, job performance and employee morale. In addition to helping employers, legal can offer brokers several distinct advantages. Legal can help improve customer retention and generate new sources of revenue. It can differentiate the broker’s product offering, adding value to the total portfolio and enhancing the ability to meet client needs for the future. Compared to other financial products, legal is easy to install, low risk, and low maintenance: a straightforward, uncomplicated benefit. Legal helps people in the multi-generational workforce address a wide range of financial, family, home and other legal needs. It’s not a complicated insurance product. The policy isn’t too difficult to decipher. Selling and servicing legal doesn’t require extensive customer hand-holding. The shaky economic recovery has increased everyone’s stress level and many employees are having trouble managing their roles and relationships in the workplace and at home while adjusting to the new normal of doing more work with less. When your clients’ employees are stressed or distracted, they’re likely less engaged, effective and efficient on the job. They’re also susceptible to such medical and mental health issues as depression and substance abuse. You could say it’s not only personal; it’s business, too, since lost productivity affects your clients’ business operations and profitability. Stressed-out employees cost American industry more than $300 billion annually in lost hours due to absenteeism, reduced productivity and workers’ compensation benefits, according to an article published by the Financial Literacy Partners, LLC called “Employee Financial Stress is Costing Your Company a Bundle And How You Can Stop It Now.” Your clients can combat these workplace problems by offering employees important resources to prevent and deal with legal issues. Employees with access to legal solutions know what to do if they find themselves in a dispute with a contractor or in the middle of a messy divorce. A legal plan reduces the time employees might spend at work researching attorneys, making phone calls and calculating out-of-pocket costs. Many of your clients’ employees work full-time, and then go home to their second full-time job – taking care of others. More than one in six employees report that they also assist with care for an elderly or disabled family member, relative or friend, according to Gallup research sponsored by Pfizer/ReACT. As Baby Boomers age, caregiving is a reality for a substantial number of employees; this special class of worker is forced to miss an average of 6.6 days of work per year because of caregiving responsibilities. Gallup estimates that the cost of lost productivity due to absenteeism among full-time working caregivers is more than $25 billion annually. This estimate climbs above $28 billion when part-time caregivers are included. ARAG’s Legal Woes Study reports that care of an aging family member is now the most common family-related legal life event. This number increased five percent since 2007. Leading legal solutions providers offer advice and consultation for elder law concerns, online tools and resources, as well as caregiver support services to assess needs, develop plans and provide information, ratings and reports on care-giving facilities. Additionally, premiere products can negotiate up to a 25% discount on caregiving services, saving employees a significant amount of money. Amid the headlines continuously reporting doom and gloom, a growing number of Americans can rest assured that having a legal plan is their best policy. And as the economy improves, legal plans can enhance positive legal life events, can also enhance such as getting married, having children and buying a house. Many brokers and employers have already enhanced their benefit portfolios with group legal plans that help employees address personal issues. This proactive approach can serve as preventive maintenance, provide services when needed and help employees achieve better work/life balance. While many employers are recognizing the need for legal insurance, only one out of nine employees works for an employer that offers group legal coverage, according to ARAG’s Legal Woes Study. That same study reports 75% of employees surveyed believe it would be a useful benefit. This new research makes a strong case for legal. If you’re looking for a cost-effective and easy-to-administer benefit to strengthen your product portfolio and client relationships, look into adding legal and financial solutions to your offering. As a member of the ARAG executive team, Dennis Healy leads the organization in building a strong and diversified distribution system. He has more than 20 years of insurance industry experience, with a primary focus in the sale of group voluntary benefit products to employer groups of all sizes. He is responsible for developing and maintaining relationships with distribution partners and employers to position legal solutions as an important part of an employer’s overall benefits offering. Dennis Healey has a bachelor’s degree in Management from Keene State College in New Hampshire. He has been published frequently in trade publications and is a featured speaker at industry conferences and seminars. For more information, visit Dennis.Healy@ARAGgroup.com. The instability of health care in the United States leaves many employers juggling important decisions. For instance, employers need to determine what immediate changes are needed as a result of rising health care costs, not to mention how health care changes affect current and future employee benefits. Some employers are taking action now. One example is by shifting the responsibility of benefit choices onto employees. As for the rising cost of health care plans, many employers are now increasing their attention to employee health and how it affects organizational profitability. Given the amount of attention dedicated to employee health, many employers would be surprised to hear that the costs they typically worry about – medical and pharmaceutical – only contribute to 30% of the total cost of poor employee health. The other 70% can be attributed to health-related lost productivity – the decline of productivity due to absenteeism and presenteeism, according to a study published in the Journal of Environmental Medicine. The advice of an effective broker partner can help employers see how the 70% is hurting their company’s bottom line. Brokers can help employers visualize the significance of this issue using the iceberg concept. Like an iceberg, medical and pharmaceutical costs (30%) are above the water, visible to everyone. The submerged portion represents the 70% of costs that can’t be seen, but require more attention. 1. Employee assistance programs (EAPs) – EAPs are intended to help employees deal with personal issues that may be hurting their work performance as well as their health and well-being. EAPs often provide counseling services for the employee and family members. 2. Disease management – Disease management targets medical conditions that are prevalent in a workforce. It helps people take more responsibility for educating themselves on their chronic issues in order to take better care of themselves and avoid exacerbating their condition. 3. Wellness and health promotion – This combination is designed to improve the health of all employees by targeting broad health-related goals, such as smoking cessation, weight loss, and nutrition. When these three pieces are combined with a program that manages absence and disability, employers can help employees deal with chronic issues, stay on the job and be productive, or return to work sooner. An absence and disability management program that uses an on-site consultant pulls all of these pieces together for a stronger approach. For example, by introducing an ergonomic intervention, an on-site consultant can help an employee who has a chronic condition stay on the job and remain productive. For back pain, it might be a special ergonomic chair. For someone who is dealing with high-stress or anxiety, it might be a flexible, more accommodating schedule that allows them to heal properly and seek the help they need while continuing to work. The on-site consultant, typically a nurse or vocational manager, puts all of these pieces together and takes the burden of absence and disability from the HR team. By identifying a program that uses an on-site consultant, brokers can help their clients better manage or reduce issues, such as presenteeism or absenteeism, increase productivity, and boost employee morale. As mentioned, absence and disability can be very costly to an organization, particularly the direct and indirect costs. Findings from various reports and surveys indicate that these costs are much higher than previously thought. Brokers must help employers understand the type of absences, the cost related to each, and how they impact their organization. The total cost of all major absences, including direct and indirect costs, average 35% of an employer’s base payroll. • Extended – Lasting more than one week, often unplanned, and due to disability (for example, Family Medical Leave Act or state equivalent). Employers typically try to mitigate unplanned incidental and extended absences with programs that manage absence and disability. The Dept. of Labor estimates that 2% to 5% of an employer’s workforce was absent on any given day in 2010. The direct and indirect impact of absence is significant, particularly the resulting cost. • Total costs of incidental, extended absences (short-term disability and FMLA) were 8.7% of payroll. • Total costs of extended disability absences, alone, were 2.9% of payroll. • Behavioral health conditions are medical conditions clustered into categories of anxiety and mood disorders. • Presenteeism-related arthritis can affect people of all ages and can cause discomfort, as well as decreased productivity. • Allergies often can cause severe problems for employees at work, given the amount of exposure to scents people can endure. Therefore, they can affect productivity. • Other conditions (for example, diabetes and obesity) have also been studied in detail as to how they affect productivity. These issues will always exist, which is why it is important for employers to get a better handle on them. Brokers, again, can be a go-to for offering solutions, such as an EAP or an integrated absence and disability program, using the on-site model. Brokers can help employers view disability carriers and products in a different light. It’s no longer about getting that STD/LTD contract for the lowest price; it’s about relying on brokers to find the right provider with programs that might solve serious workplace issues that affect productivity, employee health and well-being, as well as a company’s long-term profitability. Michael Klachefsky is national practice leader of The Standard’s Workplace Possibilities program and author of several white papers on managing absence and disability. He is an employee of Standard Insurance Company and has more than 30 years of experience in the absence/disability management and productivity industry. He can be contacted via email at Michael.Klachefsky@standard.com or 971-321-2679. The Standard’s Workplace Possibilities program helps employers prevent and manage employee absence and disability. For information, visit www.workplacepossibilities.com. Searching for disability coverage in the wrong way may be costly and can lead to big mistakes. The following tips will help you avoid some of the landmines in your search. That is sheer nonsense for a few reasons: The longer your client waits, the higher the cost will be since rates are based on age. For any number of reasons, your client may not be insurable when they finally decide to apply. In the interim, they may become disabled due to an auto accident, for example. Their loss of potential earned income would be substantial. Do you really want them to make a multi-million mistake (for example, age 30 x $100,000 a year earnings to age 65)? Mistake Number 2: Believing That Your Client Can Get Quality Coverage From Any Carrier. This is not to say any carriers are bad, but some lack the better contractual wording that allows your client to be paid under more scenarios. For example, most carriers have a presumptive disability clause built into the policy. If it says that the loss must be irrevocable versus complete, one (complete) will pay for a set of broken arms and the other will not! There may be another 20 or so of these definitions and terms. One of the “more important” ones is the definition of total disability, which governs whether a claim will be paid. Assuming that You Can Work With Just Any Insurance Brokerage or With an Insurance Friend (For That Matter) to Get the Answers and Insights that you or Your Client Will Need to Make an Informed Decision. Working with a brokerage/agency, whose specialization is disability insurance could save your client many thousands of premium dollars. It could also make the difference in whether your client is paid at all or paid just for a short period because their policy has one of the least optimal definitions. For example, there are several own-occ definitions and it is important to get the most liberal definition that eligibility allows. Mistake Number 4: Believing That Less Costly Coverage, Offered Through Group Plans or Through an Association, Will Suffice. This belief can be costly for all of the reasons mentioned above and more. For example, most if not all, have a modified definition of “total disability,” which means that a claimant will not be paid to age 65 as you may believe, but rather for only two years. The reason is that the definition usually changes to unable to perform any occupation after 24 months. This deficiency is just one of many. There could be as many as 15 or so. It’s why these kinds of plans are less expensive initially. I say “initially,” because the rates are not guaranteed and will increase with age or for any other reason at the sole discretion of the carrier. As mentioned above, that could be very costly. Would you want to buy the cheapest parachute if you were going sky diving? If you answered no, you are on the right path for getting the best disability policy available. Comparing policies and quotes is not a simple task. In fact, it’s much easier to compare prices when shopping for a car. In general, there are enough apples to apples, but how do you do that when the wording in a policy is not the same and thus how does one place a value on words? Other than some of the variables just mentioned, many definitions must be considered, such as the length of the recovery benefit period and whether mental nervous claims will be treated like any other sickness and paid for the full benefit period or only for a shorter period. As an agent, you worked hard to get where you are; now let a disability brokerage specialist work hard for you with their valuable experience. To enhance your knowledge dramatically, you should attend the International Disability Insurance Society’s 8th annual disability insurance conference, to be held in Denver on October 13th. For more information and registration, contact, disociety@aol.com. Larry Schneider is a disability insurance specialist with more than 35 years of experience. He is also an expert witness and consultant. For more information, email info@di-resource-center.com, or visit www.internationaldisociety.com, or call 800-551-6211.